The Hudson River Valley region has lately become a choice for New York City artists that are seeking a less expensive and more beautiful place to live. Many of our towns along the Hudson River are easy to reach by MetroNorth train or bus, and artists have seen the convenience of the public transportation to travel back to New York City. A major part of this lure is that even the least expensive places in Brooklyn are now out of reach for the very artists that pioneered these neighborhoods, with a “good deal” on a two bedroom apartment starting at $2100 monthly rent. More affordable living isn’t all artists are seeking, they are also in search of a community they can participate in and a place they can make a difference. Here in the Mid-Hudson region, the cities of Beacon, Newburgh, Poughkeepsie, and Kingston have become places that more and more artists are being drawn to for the community. Newburgh has a buzz of excitement as recent growth in the creative community fills in the empty buildings. Space Create is one of these new spaces opening in the past year by local recording artist and poet, Decora. The space was designed as an alternative work space for collaborative ideas between artists and businesses and flexible space for exhibits and community events. Space Create joins the neighborhood with the established Ann Street Gallery, a contemporary art gallery space that exhibits works by emerging and established artists. Virginia Walsh, Executive Director for Ann Street Gallery and resident of Newburgh for nine years said, “This is the best time I have ever seen in Newburgh,” acknowledging the upward swing in optimism for the arts. Just across the Hudson River from Newburgh is Beacon, 65 miles north of New York City directly on the MetroNorth train line. The resurgence of Beacon through the arts has been well-publicized, beginning with the opening of Dia:Beacon in 2003. The city of Beacon is now a vibrant arts destination with many galleries joining the scene, including RiverWinds Gallery on the Main Street of Beacon also opening in 2003. The gallery has featured the work of hundreds of artists since that time. Robert Rodriguez, Jr. is a great example of the artists that stepped up to build those opportunities. Rodriguez, a Beacon-based photographer has been with RiverWinds gallery since the early days. He worked with Hubbard to create the website for the Beacon Arts Community Association, and helped spread the word about the happenings in Beacon, the artists and Beacon Second Saturday. Moving further north along the train line, Poughkeepsie sits 70 miles from New York City and is home to one of the largest Oaxacan populations outside of Oaxaca. There are many in the community that honor the traditions of El Dia de Los Muertos, Three Kings Day, and La Guelaguetza, a Oaxacan dance festival. Along with this lively traditional art scene, there are also artists and community members that participate in the contemporary arts, with galleries, exhibit openings, and performances. Poughkeepsie also has great deals on real estate, with an ample supply of housing that features historic architecture, such as original tin ceilings, ornate moldings, and high ceilings. These two factors seem to be a draw for artists that are seeking an affordable place to live that could also include a studio, saving thousands of dollars every year over living in Brooklyn. 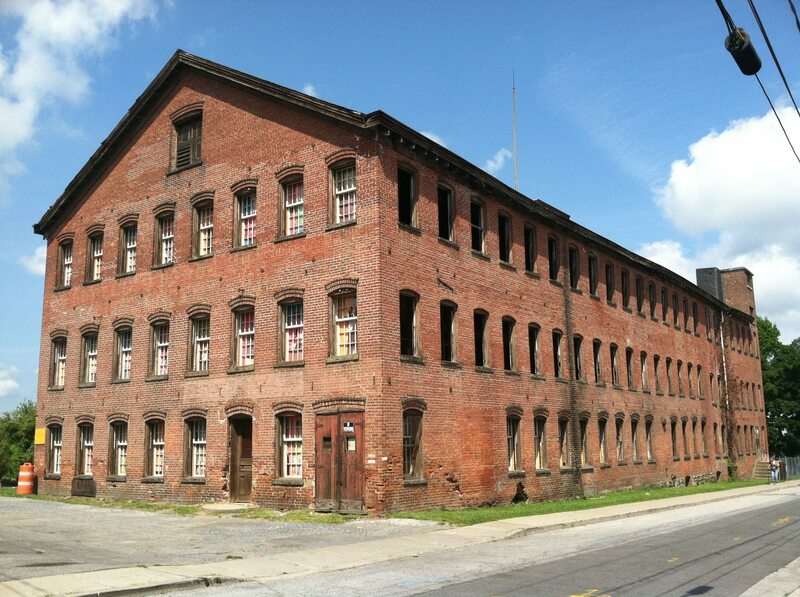 Another exciting development in the downtown area is the restoration and adaptive re-use of the Poughkeepsie Underwear Factory, which will feature work/live space for artists, traditional rental units, and a healthy local foods café and commercial space will be reserved for artists, artisans and creative community kitchen. Poughkeepsie, also known as the “Queen City” is organizing an Open Studio tour along the Main street corridor on June 20. Arts Mid-Hudson has worked for over three years to connect the arts and the business community through the Queen City Arts Initiative. Kingston also has much to offer, and has become a real draw for artists migrating north from New York City. Kingston was New York’s first capital in 1777, and is situated 91 miles from New York City. There is a vibrant collection of artists and artisans in Kingston, and the city has become a target relocation area for many of New York City’s artists. One of the latest draws is the restoration and adaptive re-use of the Lace Curtain Mill in Kingston, supported through the work of RUPCO. This exciting project has invited artist applicants to consider making the Lace Curtain Mill their home, renting five studio apartments, 32 one-bedroom units, 17 two-bedroom units and one three-bedroom unit at this location. The committee formed to review the applications is interested in a diverse selection of artists. Long time New York City resident Patt Blue has applied for a live/work studio at the Lace Curtain Mill, and commented, “I am hoping to move to Kingston because that’s where I belong. With really dear friends who are passionately devoted like me to making art, I can’t think of a better choice to live and work.” Kingston has recently passed an initiative to form the Kingston Arts Commission, and is looking at establishing a Kingston Arts District in the city.